Took at day trip to Lyon from Paris. The train tickets (sat from Gare du Lyon) weren’t cheap and since we only stayed for a day, I felt it wasn’t worth it at all- especially since we were there during the lull period, August. But I guess you can’t get the best deal every time and to be fair, we did get an awesome lunch at a super affordable price of 19.50 euros…. Lyon’s Hôtel de Ville was a majestic sight indeed. It’s the in-your-face kind of grandiose, if you know what I mean. View from the basilica. Lyon separated by the Rhône and Saône rivers. The highlight of the trip. FOOD! 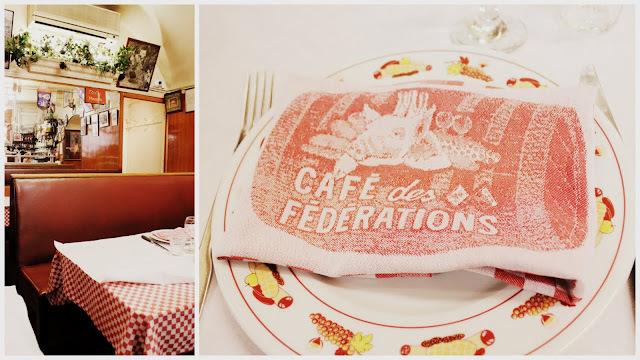 Le Café des Fédérations is one of the many traditional bouchons in Lyon. Reservations are essential. You can do it online easily, and they’ll send u an email with a confirmation (in french). Google translate is a lifesaver here haha. Print it out, or save it in your phone (which was what I did) and show it to the waitstaff. Unlike Paris, most people in Lyon can’t speak English but they do try to understand u. There is a lady there who speaks absolutely fluent English, and they’ll most likely call on her to serve you. Another tip. I find that it’s polite, and extremely helpful to say a few French phrases when you travel in France. It’s a form of respect to the locals as well. Get used to saying “Bonjour/Bonsoir, Monsieur/ Madame” when you enter into any shop or if you need any help, “parlez-vous anglais” (do you speak english? ), “Pardon” (when squeezing past people in the metro) and “merci beaucoup” (thank you very much). Anyway back to the point of this post. Appetizers were served communal style. Charcuterie, lentils, celery served with baguette. Totally unpretentious and tasty. Never had celery served like this before(update: i think it’s celery root, or celeriac. Stupid me thought it was celery as in, the green stemmed one). It was shredded and tossed in some mayo? That raw celery taste was really toned down making it very easy to eat. Lentils were cooked such that it retained the bite to it. I believe it was a mustard dressing that they were tossed in. I’ve developed an obsession with smearing mustard on my baguette- my Parisian uncle commended me for doing that lol- so you can imagine how much I enjoyed the lentils. i decided to do the adventurous thing and go for the Crayfish Quenelle, a traditional Lyonnaise kind of food. The creamy sauce was infused with all that crustacean flavour. The quenelle is something like a soft, puffy fish-cake. If you want something more familiar, go for the pork cheeks. The server pours it out of a small pot for you heated up minutes earlier so you are guaranteed a scalding hot serving of pork cheeks. Looking around you’ll find this in almost every table. Love love LOVE the architecture! *drools* You’re so lucky to be based in Dublin now! Take the opportunity and travel ard the region as much as possible! If that’s the case you’ll love paris too! Yea, I feel really fortunate to be here (: Going on exchange has it’s own set of problems but the experience is priceless. I will! – C’est un saucisson lyonnais avec des pistaches, servi avec des lentilles. 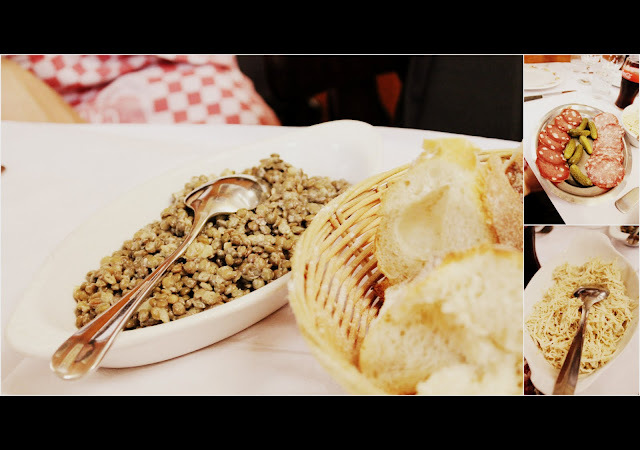 – It’s a Lyonnaise sausage with pistachio nuts, served with lentils.